KALAKA ON THE BEACH - Discover Gracious Old Hawaii Charm in this renovated vintage Kaiua Beachfront home, offering 3 very spacious bedrooms, each with private bath, and a ballroom of a fabulous living room. Enjoy a covered back lanai with a beautiful newly tiled swimming pool and pool deck plus jacuzzi. The private dining room seats 8, and there is a cozy breakfast nook in a wonderful large kitchen; the living room opens up completely to the beachfront deck and beautiful oceanfront lawn area; there is an entertainment cabana, set up with outdoor furniture, built-in barbeque, outdoor lighting for evening ocean views. High speed internet access. This is a Hawaii Retreat! Nonsmoking. Just steps through your beachfront yard's Naupaka hedge to the sand & sea of Kailua Beach! Great mountain views of the Ko'olaus from the poolside of the house. Large oceanfront patio deck with tables, chairs, chaise lounges plus a private entertainment area with tables,chairs, bleachers, barbeque, protected from wind by a fence just adjacent to the beach - to enjoy dining while listening to the sound of the ocean... Poolside patio on mountain side of house with seating area and gas barbeque. gracious large rooms, extremely large living room with sliding glass doors all across to the oceanfront lawn and beach/ocean beyond. Great location and spacious beach house. Older property with classic charm. Perfect for a beach week with family and friends. My only suggestion is that it would be great to have a closable door between the back bedroom and a fourth bedroom / library instead of a screen. Very attentive property management. Overall our stay was great. The location was amazing and the house comfortably fit my family. They had everything you could want from a beach accessory standpoint so there is nothing you need to worry about while you are here. This is a great place an would definitely recommend it to others. Our family had a wonderful time in Kailua at this beach front property. The location could not be better with a beach sunrise just outside the back door. I loved long walks on the beach before and during sunrise or just before dusk. The property is well appointed with great space for a family. We enjoyed dinners in the kitchen and were grateful for the nice sheets and towels - a very important part of our stay in our opinion. Uta was so gracious with a lovely welcoming basket. She went over and above for any minor issues. The house is around the corner from grocery stores, Starbucks, restaurants (including Buzz's!) and shops. Great place for the perfect Oahu vacation! Kalaka House was pleasing in every way! Our family of 8 loved it! True to Hawaiian style with open spaces and ocean breezes. Sounds of the surf in every room. Beautifully furnished, refreshing pool; a delightful experience. We’ve enjoyed stayed in Kailua several times and Kalaka House is the most lovely of accommodations, mahalo nui! 2nd time visit to Kalaka and its an amazing place! PRIME location right on the beach. The house itself, is well equipped with everything you need. My family of 8 settled in quite nicely and had PLENTY of room to hang out. The back yard (facing the beach) is perfect for hanging out and the BBQ area is great as well. Pool/Hot Tub are perfect as they sit right around the kitchen/tiki bar window. PERFECT if you want to make a drink and still see the crew of kiddos! There is also a great selection of beach toys, boogie boards, chairs, umbrellas, towels to use. UTA the property manager is always a pleasure to deal with. Mahalo for the welcome basket of goodies! Hope to see you again soon! 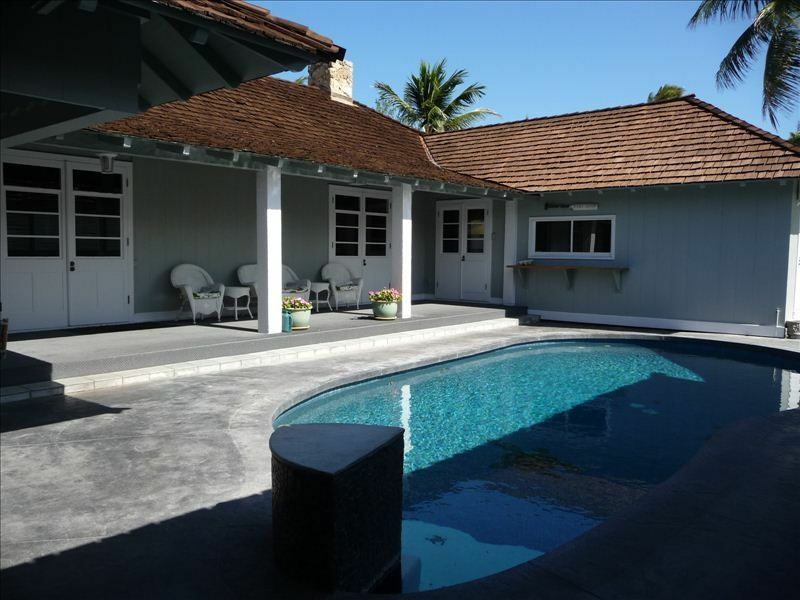 Beautifully maintain Hawaiian Home on a perfect beach. Uta was exceptionally helpful both before and during our stay. Everything you need is here away from crowded Waikiki. Just 25 minutes from Waikiki Beach & Honolulu Downtown! Taxes 14.9166%, Departure clean fee $700, Refundable security deposit $1,000, please inquire for further details, aloha!